The problems can be readily solved in time with a time-stepping resolution or with the natively supported multiharmonic resolution method. In the latter case the steady-state solution of a time-periodic problem can be obtained in a single step, for linear as well as for nonlinear problems. The library comes with hierarchical high order shape functions so that high order interpolations can be used with an interpolation order adapted to every unknown field and geometrical region. The built-in geometry definition and mesher can be used for now for rather simple 2D or extruded 3D geometries. For general geometries and advanced meshing the .msh format of the widely-used open-source GMSH meshing software is supported. Points, lines, triangles, quadrangles, tetrahedra, hexahedra, prisms or any combination thereof is accepted in the mesh. The result files output by sparselizard are in .vtk (ParaView) or .pos (GMSH) format. 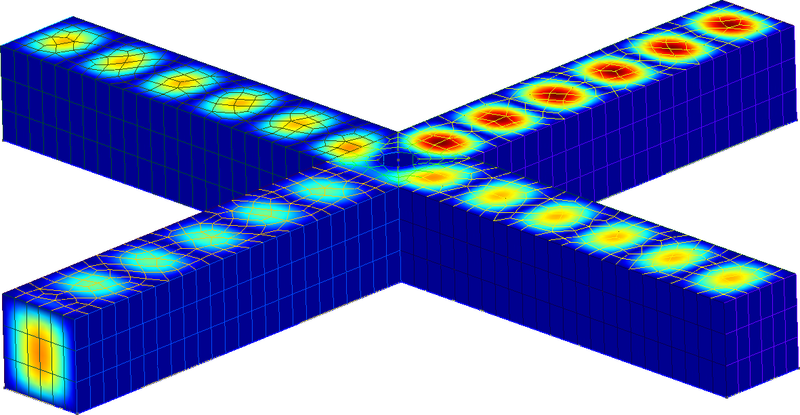 A cross shaped perfectly conducting 3D waveguide is excited with an imposed electric field at one end. Follow this link for a transient time resolution video. 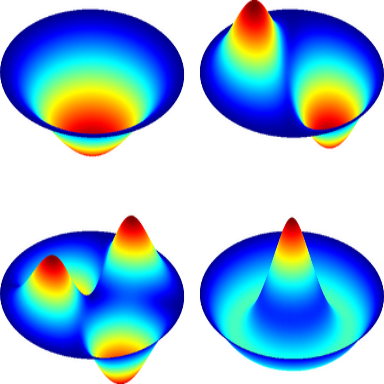 The eigenmodes and eigenfrequencies are obtained for a 3D disk clamped at its boundary. An AC voltage is applied to a coil surrounding an aluminium tube in which currents are induced. In the current density image displayed the skin effect in the thick copper wire of the coil is also visible. 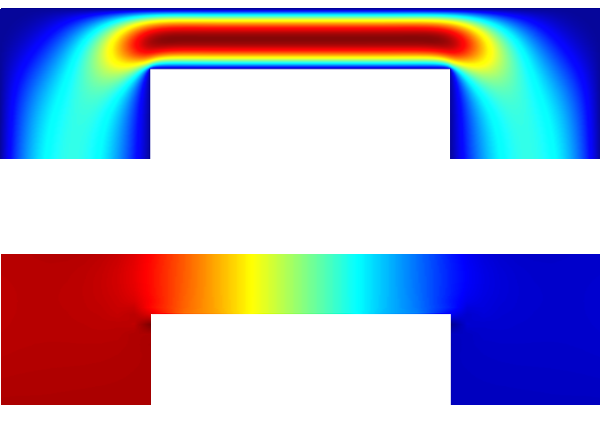 The flow speed magnitude (top) and the pressure field (bottom, 100 Pa at left inlet and 0 Pa at right outlet) are computed for a low Reynolds (Stokes) flow in a microvalve. This mechanical steel structure is automatically optimized to withstand a given force with the minimum possible steel volume. 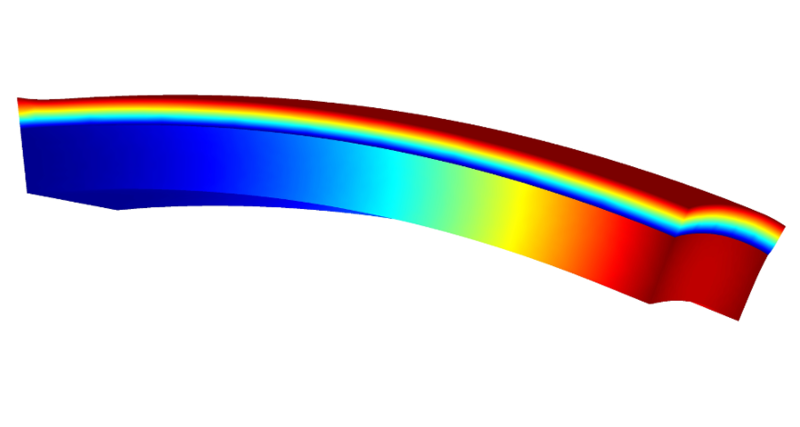 This was obtained with a third-party C++ topology optimization code developed using the sparselizard library for all finite element calculations. A micro-sized bilayer is made up of a piezoelectric PZT layer and a polysilicon layer. The piezo is sandwiched between two electrically actuated electrodes. The harmonic actuation creates a harmonic deflection of the bilayer. Follow this link for a time visualisation video. 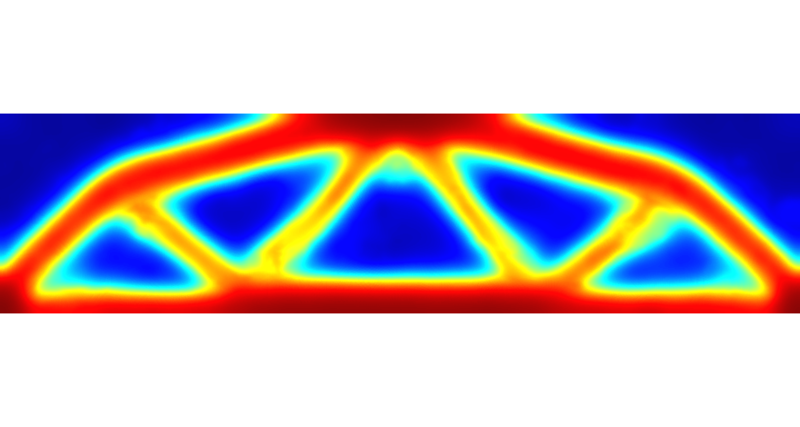 A prestressed 3D bilayer micromembrane is pushed downwards by the atmospheric pressure. The static deflection and resonance frequency shift is simulated thanks to a small-strain geometric nonlinearity formulation. With little effort this example can be adapted to simulate buckling in time, as shown in this video. 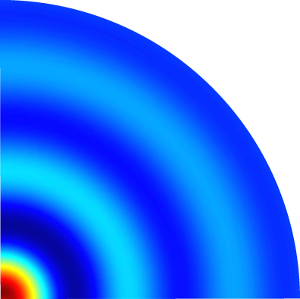 A piezoelectric actuated micromembrane (PMUT) outputs ultrasound pressure waves in air. The simulation is performed in 2D using axisymmetry. Follow this link for a time visualisation video of a smilar device (CMUT). A voltage is applied across a 3D tungsten conductor in vacuum. 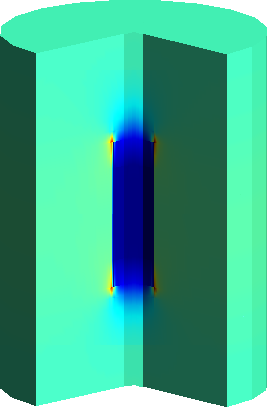 The (strong) DC current flow as well as the induced thermal heating (displayed) is simulated. The influence of the temperature on the material properties is taken into account with a nonlinear loop. 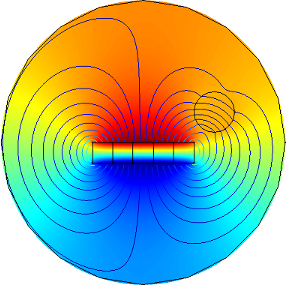 The static magnetic field created by an array of permanent magnets is simulated using the scalar magnetic potential formulation. The Halbach configuration shows as expected a magnetic field strength increase. The potential and the magnetic field lines are illustrated. 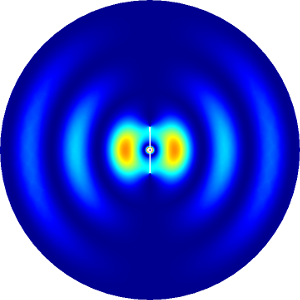 The 1 GHz electromagnetic wave radiation of a half-wave dipole antenna is simulated. 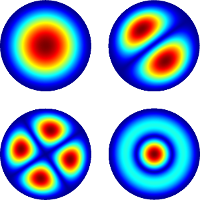 The electric field, magnetic field and Poynting vector are computed and can be visualized in time. The electric field can be visualized here. 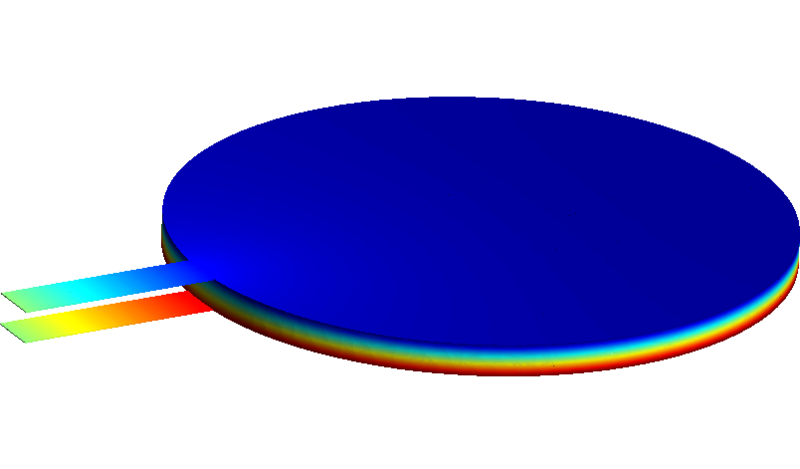 The collapse mode of a CMUT ultrasonic transducer is simulated (in collapse mode the membrane touches the bottom of the cavity). 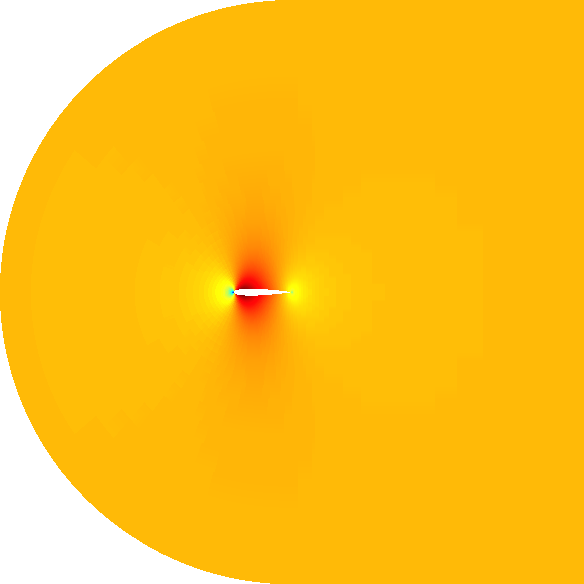 The static deflection as well as the small signal vibration are simulated and illustrated on the image. The collapse mode of a CMUT can be visualized here (vibration in a fluid) and here (static collapse). 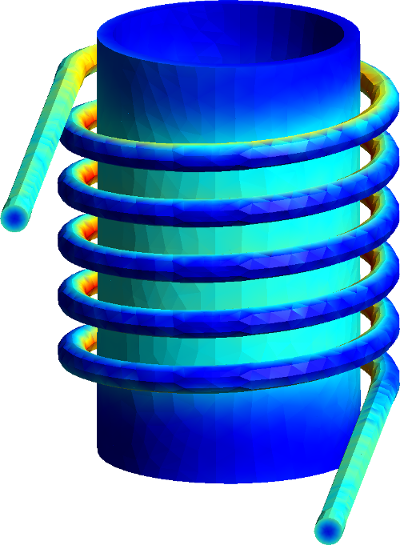 A 3D steel cylinder is placed nearby a wire with a given static current density. The magnetic vector potential formulation is used. A gauge condition is added in combination with a spanning tree to remove the singular matrix problem associated with the formulation. The sparselizard geometry builder and mesher are used to create and mesh this simple 3D mechanical structure (top view above). The deformation of the structure subject to a torsion force is then simulated. A NACA0012 airfoil is put in a subsonic air flow. The problem is nonlinear because the air density is a function of the air speed. 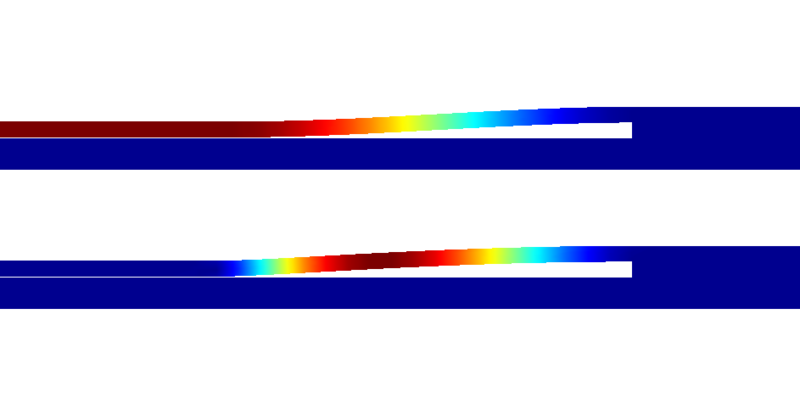 The picture shows the Mach number everywhere around the airfoil. A thin superconducting tube is subject to an applied magnetic field that increases over time. As the magnetic field is increased it progressively penetrates in the tube until the tube is not able to perfectly shield its interior volume anymore. The time-solution can be visualized here. The resistance and capacitance is computed for a 3D geometry made of a conducting trace connected to a circular-shaped, parallel-plate air capacitor. The simulated capacitance matches the parallel plate formula. The quadrature electric potential field is displayed on the picture above. 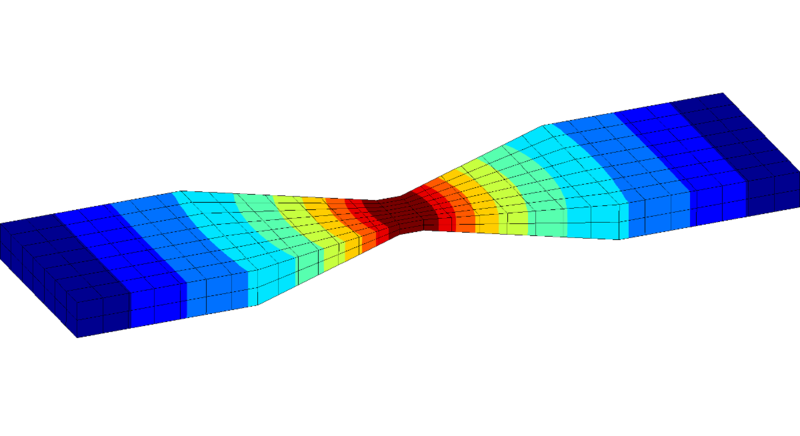 The nonlinear Navier-Stokes equations for incompressible laminar flow are solved with a Newton iteration to simulate the water flow past a step in a 1 mm pipe. 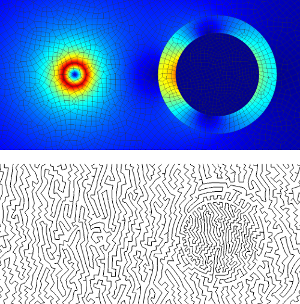 The top image shows the flow velocity, the bottom image shows the pressure field. The easiest way to get the sparselizard C++ finite element library running on Linux and Windows 10 is to use its static library, even though better performances will be obtained when compiled on your computer. Download the static library here (or here if no AVX support) and open the folder in a terminal. A virtual Ubuntu Linux can be easily installed using VirtualBox. Take a look at the examples in the 'examples' folder and at the documentation for a smooth introduction. 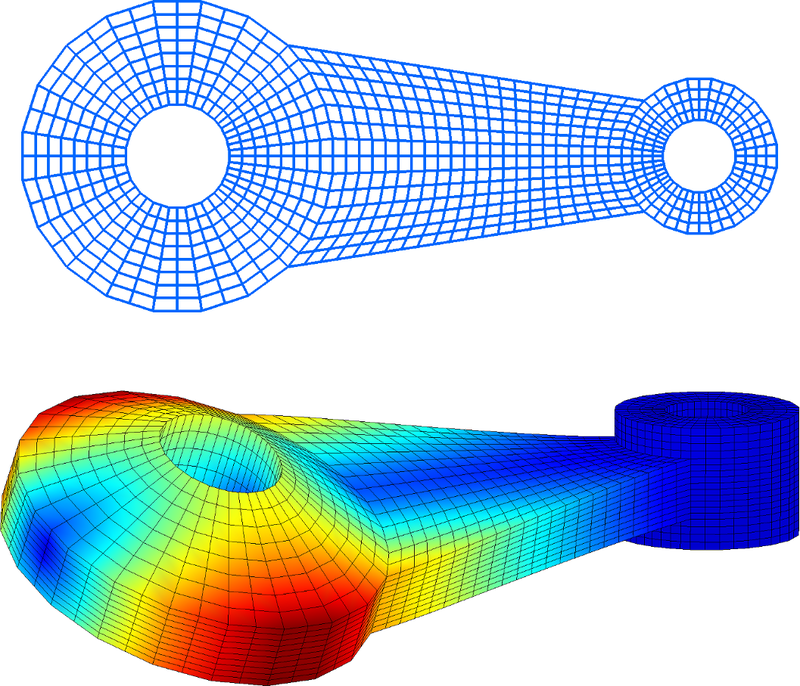 "Sparselizard - the user friendly finite element C++ library"
It would be a pleasure to answer any of your questions or to get your bug reports. In the latter case please provide a minimal code including the bug.